I had to go to Philly for a wedding this weekend. I don't go to that many weddings so a few things were a little strange but we'll get into that later. The trip down was great I set a new personal record for time, made it door to door in 5 hours and 6 minutes. And yes I keep track of these things! I couldn't wait to get my first WAWA coffee and lemon Tastykake to go with it. Most of you have no idea what WAWA is but take Store 24, add in 7-11, throw in your corner sub shop and then put it on steroids and you have WAWA. Yes I know the name is dumb, deal with it and move on. The actual ceremony was quick and fairly painless. Thankfully it was non-denominational so I didn't have to listen to all the religious nonsense. It was pretty clear that the bride had taken a sedative before the ceremony and the groom was either bombed or stoned because he laughed through the whole ceremony. I'm not sure who was more pissed the bride's mom or the pastor. Is it a pastor if the wedding is non-denominational? What do you call her? These things confuse me. I'm just glad it's over, I hate having to talk to people I don't know. I don't care what your wifes name is, what college your kid goes to, and I really don't care what you do for a living because I'm fairly certain it's boring. We'll do a lot of driving around today before heading back early tomorrow morning. I am stopping off at Tony Luke's for some food and there is absolutely no way in hell I'm bringing any of it back for you Smiddy. Anybody what me to bring back anything? WAWA coffee, some Tastykakes, maybe a few cheesesteaks? 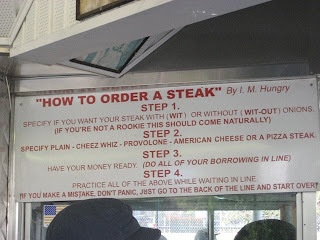 And yes I said a cheesesteak not a steak and cheese. Get it right people.